Sometimes I feel like I have been sick since November! I’m down with yet another cold/flu but I keep telling myself that this is IT, the last one for winter, no…..really! Regardless, here’s a recipe for you though I am slacking on the picture. Sorry! Recipe Notes: Just to be clear….this is using a fully cooked, smoked bone in ham NOT a raw ham! Since we have a small family, I cut the ham in half. I cook half now & then freeze the other half to cook later. If you have a big family (really big) you can cook the whole thing. Directions: Preheat oven to 350 degrees. Place ham cut side down in a large oven proof pot. Pour in Coke. Cover pot with lid or aluminum foil. Bake for ~2 hours. Mix brown sugar, mustard and juice into a thin-ish paste. Take ham out of the oven, pour out most of the coke (leave about 1/2 inch), and brush mixture on the ham. Recover and put ham back in the oven for another 30 – 45 minutes. Let rest for a bit before cutting. Serve. Leftovers & the ham bone can be used to make Crockpot Split Pea soup (which is what I did) or Ham Tetrazinni. This is a very inexpensive way to make dinners for the whole week. I bought my ham at Costco for ~$20. We cut the ham in half. We cooked half for dinner Sunday night and froze the other half. I then made Split Pea Soup for supper last night. Half of that went in the freezer. So for a $10 half of ham we got 2 dinners, tons of leftovers and a dinner of soup in the freezer. Visit Shan over at The Fairy Blogmother to see what else is cooking this Wednesday! 365 Day Photo Project – I almost forgot to post it! 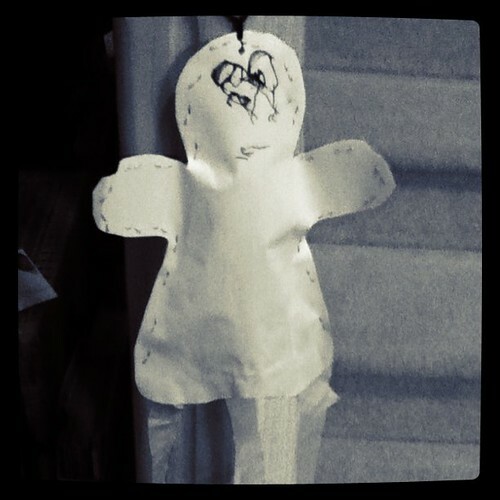 Evan’s Halloween ghost is still up after New Year’s. Might as well leave it up until Halloween now! YUM! This ham sounds delicious.. I will have to give it a try! Mmmm sounds great. We love ham. Thanks for the recipe Merry!